Indian athletes have been making their mark in almost every sport. Be it men or women, new records are broken regularly and stars are born that make our country proud. India's sportspersons are known not only for their qualities on the field of play but for their ethics and values as well. India won the Asia Cup Hockey final against Pakistan last year after a nail-biting and aggressive game from both sides. However, one particular incident involving Birendra Lakra highlighted how sport is above any political tension on the field. Pakistan were on the attack as they were trailing after Nikkin Thimmaiah had given India the lead with few minutes on the clock remaining. Pakistan's Bilal Aleem was looking to cross the ball to his teammates with 8 minutes left to play. However, the ball touched Lakra and went out oh play. The Men in Green immediately appealed the decision, claiming that the ball hit the defenders leg. If India were to win this particular match, they would regain the title after five long years. In the last edition India finished fifth, including an embarrassing defeat at the hands of Pakistan. Hence, Lakra could've easily made Pakistan use up their last referral. The referee wasn't so sure about the corner and he was going to contact the review umpire. But, Lakra came running up to him and said, “It is a penalty corner, please don't use up their last referral, your position was such that you might have missed it.” The referee realized his mistake and immediately halted the review process. 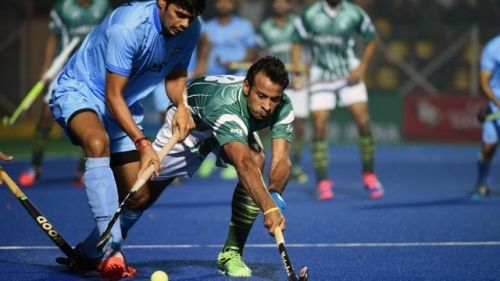 The eventual penalty corner did not yield a goal for Pakistan, but what specifically stood out was the sportsmanship, during a match with really high stakes. The Pakistan coach K M Junaid even went and embraced Lakra, thanking him for the gesture. Every player of the Pakistan squad thanked him for not leaving the sportsman spirit behind at the most crucial point of the game.